Many readers wonder if they should be taking eye health vitamins either to prevent macular degeneration or to slow its progression. My husband and I wonder about this question as well. 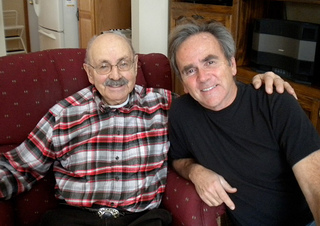 He is at risk for AMD because of a strong family history and both of us are not getting any younger. Dr. David Nelson, OD and Kerry Salsberg, OD try to answer your questions and mine on this important topic. 1. 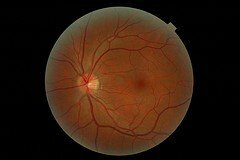 Explain what is the macular pigment and what role does it play in the prevention or development of macular degeneration. 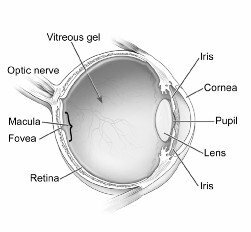 Macular pigment is the yellow substance in the center of the retina (or macula) that provides protection from blue light present in the visible spectrum of light that enters the eye. The yellow substance is comprised of carotenoids which is present at birth, declines over time with age, obesity and smoking. Like ultra-violet light which is not visible and normally is absorbed mostly by the crystallin lens, blue light does enter the eye and can be harmful to the eye over time. 2. What is macular pigment density testing and where can a person have it done? The amount of yellow substance can be tested by an instrument designed to measure heterochromatic flicker of the patient using their responses to the stimulus. The ingestion of more carotenoids or supplements by patients over time will increase the amount of yellow substance in the eye and can be measured. 3. What ingredients are found in MacuHealth eye vitamins? Do they include the same ingredients used in the AREDS? Why or why not. The AREDS study was a study designed by the National Eye Institute to determine if a limited multivitamin could decrease the incidence of people developing macular degeneration. The study found that the limited multi-vitamin of 500 mg of C, 400 IU's of E, 80 mg of zinc and 2 mg of copper decreased the incidence of macular degeneration twenty-five percent. In addition to supplementing patients with this vitamin, the study measured patients dietary habits including medications, height and weight measures to determine if any other patterns of activity might decrease macular degeneration. In studying the dietary effects of carotenoids, it was determined that they could make a major difference in the reduction of macular degeneration. Because of this information from the first study, a second study has been underway for three years with carotenoid supplementation. The problem is that the results may not be know for 3-5 additional years. Macuhealth contains all carotenoids - 10 mg of lutein, 10 mg of meso-zeaxanthin and 2 mg of zeaxanthin. The supplement is designed to be added to other multi-vitamins such as the one from AREDS1 without causing any complications. 4. What makes MacuHealth different from other eye health vitamins that are available? Macuhealth is the only eye health vitamin to contain 10mg of meso-zeaxanthin which is thought to be the crucial carotenoid in the very center of the macula and commonly thought to be missing in patients that develop AMD. 5. Who should take MacuHealth eye health vitamins? Those who should take MacuHealth are any patients concerned about developing macular degeneration. I recommend MacuHealth to patients who are at risk of developing AMD or those suffering from the disease. The three undisputed risk factors for AMD include a positive family history of AMD, increasing age, and smoking. Other environmental and lifestyle risk factors include exposure to high-energy blue light, pale complexion, poor dietary intake of carotenoids (anti-oxidants), obesity, and having low levels of macular pigment. People that show early signs of macular degeneration will require Macuhealth for life to help slow down progression or to stabilize the damage. The ultimate goal of supplementation is to mitigate the risk of the developing AMD and the sooner the proper risk analysis/examination is undertaken the better the outcome. 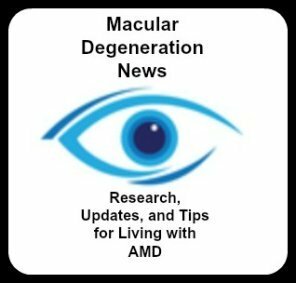 Beyond AMD, we now know that increasing levels of macular pigment through diet or supplementation also positively impacts visual performance. Recent studies have demonstrated improved contrast sensitivity, reduced glare, and faster visual processing. Patients who complain about driving difficulties or glare are often great candidates for Macuhealth. 6. Is the dose different for those with low macular pigment density or who have macular degeneration? 7. MacuHealth is not sold in stores. How can a person get these eye vitamins? MacuHealth can be obtained by eye doctors or on-line at the Macuhealth.com site. 8. Do you only ship to the US and Canada? US orders are processed by MacuHealth LLC and Canadian orders are processed by Bright Optical Inc.